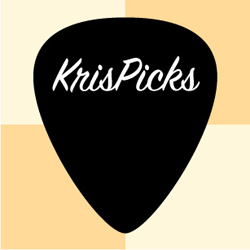 V-Picks is a pick manufacturing company based in Nashville, Tennessee, that produces cast acrylic guitar, mandolin, and bass picks at a starting price point that I would classify as the so called “boutique” level of guitar picks. All of the V-Picks that I have had the pleasure of trying have been very well made, and are nice to look at. I emailed Vinni Smith, the company’s owner, for some information on how their picks are made and this is what he had to say. The Euro and Euro II picks are made of cast acrylic. Cut out with a laser machine and then hand buffed on a bench grinder. Then heat treated, heat tempered, and buffed with a flame. A lot of hand work is done as with all of our picks. I designed the Euro for the Jazz III players, so they would have another option. Small, yet a huge tone and fast action. I think much faster action than the Jazz III. 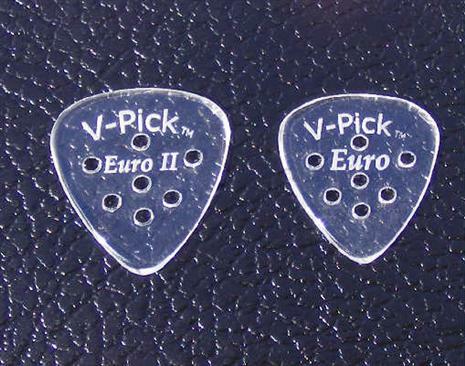 The V-Pick Euro and Euro II are two different sizes, but the same thickness and relative shape. The Euro II is the larger of the two. They are made of clear acrylic with seven holes drilled through the picks. The holes are a feature I really like, as they do help with gripping the pick more securely with your fingers. I did not have any problem with dropping these picks or having them fly out of my fingers while playing. I initially chose the Euro and Euro II to try first because I really liked the tone these picks produced (yes other V-Picks do sound different than these) especially when using a clean tone or light overdrive while playing electric guitar. From my experience the Euro and the Euro II do allow you to play faster cleaner lines without any additional practice than what you can do with your favorite Jazz III pick. Some of you may notice some acrylic pick chirp with these picks, but I found a slight change in picking technique/angle mitigated this issue. Did I mention you can play faster without any additional practice? I did! That should get plenty of people excited about trying these picks just for that added feature alone. I used both the Euro and Euro II picks for my electric guitar practice at home and in a several band situations for live performance. I found I really liked the big fat tone of the Euro II when I practiced at home, but when playing in a band situation with two electric guitars, acoustic guitar, keyboard, bass and drums I quickly found the Euro II to be too much pick for the job. The sound was too big and thick for what I wanted to hear, so I switched to the smaller Euro V-Pick which gave me the more focused sound I was looking for. It is interesting to find what works at home doesn’t always work with a full band. I have found V-Picks do not wear down very quickly, so you can plan on using the Euro or Euro II for a long time unless you misplace or lose them. For playing Jazz music I don’t think there is a better pick out there than the Euro. At least not one that I have tried to date, and I have tried quite a few. For softer rock music the Euro is a good pick as well. For harder rock the Euro II is a good choice if you want a heavy, thick pick attack. For speed picking these picks do well, but I have found some other picks to be better, which I will reveal in forthcoming pick reviews. Give the Euro and Euro II a try if you currently like the Dunlop Jazz III. You may just find your next favorite pick. 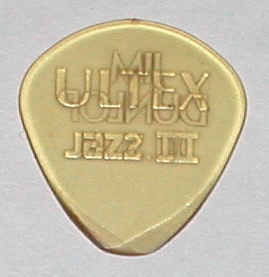 Let’s start off with the guitar pick I use the most recently when playing electric guitar, the Jim Dunlop Ultex® Jazz III. What is Ultex®? Ultex® is Jim Dunlop’s brand name for Ultem™ resin. What is Ultem™? It is amorphous thermoplastic polyetherimide (PEI) resin. Ultem™ is used in the Aerospace industry, Healthcare, guitar picks plus other things. It has good strength and stiffness, and outstanding dimensional stability (Ultem™ is tough stuff). Ultem™ is available in several transparent and opaque colors. If you want to learn more you can view the full lowdown on Ultem™ here. I have several Altoids tins full of various guitar picks I have purchased on my quest for the holy grail of guitar picks. I can honestly say every pick material I have tried has given me a different sound from my guitar. This is where it really pays to use the right pick for the right job if you have to go for a certain sound on a given song. I have found for lead guitar work and a good amount of rhythm guitar work that I have been doing, the Ultex® Jazz III has been my go to pick over the last couple of years. It took me a while to get used to the Jazz III size, but once I did I have found this pick to be quite useful. The pick is a transparent amber color an has molded raised lettering on it, which gives you a good grip on the pick. I notice very little slippage while using this pick. The pick has a pointed tip with rounded edges that help the pick to glide over the strings. The pick is quite stiff for a 1.38 mm pick, more like the stiffness of a 1.5 mm – 2.0 mm pick. The stiffness allows for fast articulate playing. I have found over time the picks do wear down after quite a bit of use. They wear down far slower than many other guitar pick materials, however. 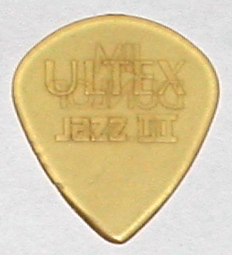 Below are a couple pictures of Ultex® Jazz III picks I have used to show how they wear. The pick above is a relatively new pick with some roughness on the side edge from doing pick scrapes. The tip is still in good shape. The pick below is a pick I have been using for many months for my daily practice sessions. The tip has rounded off, and the edges have beveled. I have since switched to a newer pick of the same type, and this one sits on my desk as a backup. How do they sound? I would describe the sound as clear, bright and plinky sounding, for lack of a better term, when playing single note lines. Pinch harmonics are fairly easy to conjure with this pick. When playing chords you get a really smooth sound with good articulation. I read on the Premier Guitar web site in the article called The Spectrum of Plectrum, where they were interviewing Jim Dunlop, he likened the sound you get from Ultex® is very similar to Tortoise shell (Tortoise shell was a highly regarded, sought after guitar pick material. Due to some of the large turtles and tortoises becoming an endangered species. It is no longer legal to manufacture Tortoise shelI guitar picks). I keep trying different picks, but for a large portion of the material I play, which revolves around mostly Rock, Pop, Punk, Classic Rock, Contemporary Christian, and 80’s Metal. I keep coming back to the Ultex® Jazz III.